Smart Socks are equipped with various sensors and are connected with various mobile devices. These smart socks can provide pressure on acupuncture points of the legs and can help to stimulate blood circulation. Apart from this, smart socks can retain water thus keeping feet dry and fresh. Global smart socks market is expected to experience a remarkable growth during the forecast period i.e. 2017-2024. High adoption rate of smart wearable among people and increasing cases of venous disorders are major factors which are anticipated to be the dynamic factors behind the growth of global smart socks market during the forecast period. 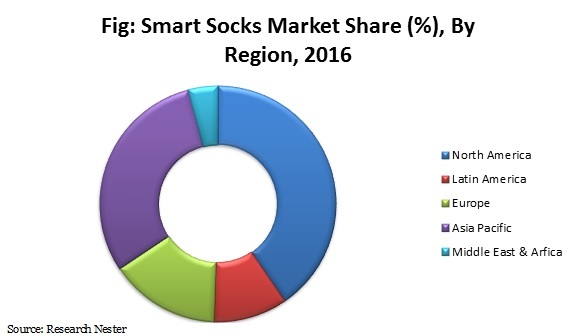 Regionally, North America is anticipated to account for a significant portion of market share in the overall market of smart socks during the forecast period. Factors such as, increasing geriatric population in the region is anticipated to fuel the growth of the global smart socks market. Moreover, growing adoption of technology enabled smart socks advancement is opening a gateway of opportunities for the domestic and foreign vendors over the forecast period. Europe smart socks market is expected to witness substantial growth over the forecast period. Factor such as, rising innovative and interdisciplinary technologies and products are envisioned to strengthen the growth of smart socks market in Europe. Moreover, Asia Pacific is poised to record fastest growth rate during the forecast period. Countries such as China, Japan and India are anticipated to exhibit faster growth rate as compared to other countries in the region. Moreover, the advancement of technology in smart socks is anticipated to fuel the growth of the Asia Pacific smart socks market. Growing incidences of venous diseases is poised to drive the growth of global smart socks market. Moreover, increasing diabetic population across the globe is expected to impel the expansion of global smart socks during the forecast period. Additionally, the potential to prevent foot ulceration and reducing the number of amputations based on early recognition of pre-ulcerative areas is anticipated to foster the growth of the global smart socks market in the upcoming years. Furthermore, growing geriatric population across the globe is anticipated to increase the growth of the global smart socks market. Further, increasing advancement in smart apps regarding smart socks is anticipated to foster the growth of the global smart socks market. Further, innovations in smart socks products such as detection of inflammation and injury of feet & product improvisation to ensure diabetic patient comfort are expected to drive the growth of the smart socks market. Moreover, an antimicrobial fabric, have moisture evaporation properties in the smart socks. This factor is anticipated to foster the growth of the smart socks market during the forecast period. However, high cost of smart socks and lack of awareness about smart socks is some of the key factors which are expected to limit the growth of global smart socks market over the forecast period.